Medicardium heavy metal cleanses an OTC product that allows anyone to enjoy the benefits of chelation therapy at your own home. This is a kind of detoxifying supplement that cleanses the heavy metals from your body. Also, the accumulation of heavy metals can have a severe effect on your health. With Medicardium Chelation Therapy, you get a deeper and more rejuvenating sleep. Besides, Medicardium EDTA therapy is easy and convenient to use. It’s inserted rectally just before going to bed at night. EDTA or Ethylene Diamine Tetraacetic Acid has been used for more than 50 years to aid the body in detoxification of heavy metals. These include mercury, lead, aluminum, arsenic, cadmium, nickel, and uranium. In this 21st century, we live in a toxic world, where we have very little time to look after our health. Every day, we are exposed to a significant amount of toxins in one way or the other. Over the years, these metals (toxins) get accumulated on our soft tissues. Because the effects of toxins on our body show gradual results, we often relate them to aging. While we do not know the real cause of our health problems. In short, this article will make about the toxic metals that can affect your body and you should remove them. The toxic metals that affect our body functions are mercury, aluminum, uranium, cadmium, nickel, lead, barium, and arsenic. Firstly, heart attacks are these days one of the leading cause of death in America. The reason is the busy lifestyle and unhealthy eating habits. People these days take medications to keep their body fit and healthy, which is not a good habit. A poor eating habit, lifestyle diseases, stress, increased use of health supplements and the effects of aging can cause a damaged heart. Also, your circulatory system is one of the most vital components of your body. Your heart pumps 1,900 gallons of blood through 100,000 miles of arteries and veins. If you fear that you might be suffering from circulatory problems or that you wish to increase your vitality, then consider asking your doctor if Medicardium chelation could help you. Similarly, accumulation of mercury can happen from various sources. For instance, gum chewing, acidic saliva, tobacco smoking, grinding of the teeth at night and drinking too much hot liquids can increase the level of mercury in one’s body. When there is too much mercury in your body, it can lead to depression, stress, anemia, tremors, memory loss, heart attacks, and auto-immune diseases. Besides, a high dose of aluminum in the body can cause Alzheimer’s disease and Parkinson’s disease. Also, aluminum is seen in everyday items like drinking water, baking powder, antiperspirants, feminine hygiene products, cow’s milk, aluminum foils, pots, antacids, and pans. Do you know that high levels of lead in your body can cause low memory and IQ? Yes, lead can accumulate in the liver, kidney, brain, and bones, causing different pathological conditions. These include insomnia, irritability, reduced focus and attention, stomach discomfort, fatigue, and poor muscle coordination. EDTA has shown proven effects in removing barium from the body; barium toxicity can cause abdominal pain, vomiting, and diarrhea. Barium is usually seen in paper, glass, ceramics, soaps, plastics, paint and rubber. Another toxic metal that causes health disorders in people is the nickel. Nickel tends to accumulate in the brain, kidney, bones, lungs and immune system. You can try Medicardium heavy metal cleanse therapy to overcome these problems. Arsenic is another toxic metal that when accumulated in huge numbers can cause a list of disorders. These disorders include confusion, headaches, and sleepiness. Arsenic gets accumulated in the body due to cigarette smoking, laundry detergent, drinking beer, seafood, and regular drinking water. To get rid of arsenic from your body, use EDTA based suppositories like Medicardium. Apart from these metals mentioned above, cadmium and uranium are other heavy metals that can harm your body. Cadmium can irritate the digestive tract and cause kidney failure. It can also damage your lungs. Medicardium is effective in removing cadmium from the human body. Likewise, uranium is a radioactive metal which emits high quantities of beta and gamma radiations. These are harmful. One of the reasons Medicardium has such a relaxing effect is its unique use of magnesium di-potassium as an EDTA carrier. This formula in suppository form has many distinct benefits. Magnesium Di-Potassium EDTA has a higher absorption rate than traditional orally consumed tablets. Medicardium EDTA therapy helps the body in the mobilization of soft tissue dystrophic calcium. Each box contains ten suppositories and can last up to one month. Medicardium Heavy Metal Cleanse Benefits – Does it Work For Heavy Metal Cleansing? Medicardium in suppository form has many benefits. It has a distinct advantage over both oral EDTA supplements and IV chelation as well. While taking oral EDTA chelation therapy, only the essential minerals are chelated in your digestive tract. This makes them unavailable and difficult to cleanse. IV chelation method, on the other hand, is good therapy. It has saved many lives. The disadvantages include the use of needles, a large dose of EDTA and high cost. 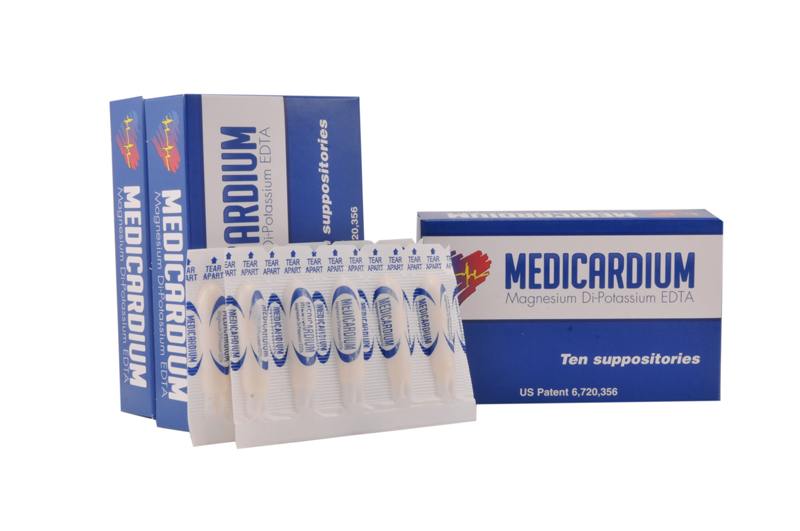 Medicardium, on the other hand, is economical and easy to use. The results are quick you can do it at home. This heavy metal cleanses therapy is highly effective in detoxifying the heavy toxic metals from your body. Only certain doctors do oral EDTA chelation therapy. Hence there is a big problem with accessibility. But with this formula, you can conduct the chelation therapy, just by sitting at home. This makes Medicardium one of the reasons to buy. As mentioned above, huge doses of calcium can cause faster aging. But with this formula, you need not worry. The unique method of Medicardium reverses the aging effects of calcium built-in soft tissues. First, you need to understand a little about the EDTA chelation. The various elements such as calcium, magnesium, aluminum, and lead have different atomic weights. They are categorized under heavy metals and are also toxic to the body. Whereas calcium, zinc, magnesium, and selenium come under lighter elements. It contains magnesium di-potassium EDTA, which chelates out calcium from the soft tissues. This shifts the calcium balance in the blood, making the body think it has too little calcium. Magnesium Di-Potassium EDTA: Magnesium Di-Potassium EDTA is what gives Medicardium the relaxing effect. It is used in Medicardium for suppository chelation. This is safe to use by adults, who may be in a sodium-restricted diet. For those who use calcium channel blockers, this is best recommended, as it is calcium free. It is recommended that all users take a calcium supplement after 12 hours of taking Medicardium. This is because magnesium Di-Potassium EDTA can help mobilize dystrophic calcium from the body soft tissues. Young people can use Medicardium, whose veins are not developed enough for intravenous therapies. White wax: Whit wax is highly prized for use in medications and ointments because of its purity. White wax is added to medicinal salves as a thickening agent. Cocoa butter: It uses organic cocoa butter. Cocoa butter lowers blood pressure, with its high arginine content. Low blood pressure levels reduce the risk of cardiovascular diseases. This is taken in three levels, in regards to the number of suppositories a user may choose. Level 1: At this level, the user is supposed to take 15 boxes of suppositories, which is equivalent to the 15 I.V chelation sessions. Studies have found reduced chances of heart attacks and decrease in cancer by following this method. This is meant for people who want to improve their health and who would want to avoid these two diseases. Level 2: At this level, the client will take boxes depending on their age in years and subtracting 20. Which means a 55-year-old person would take 35 boxes. But a 25-year-old would still do 15. this protocol will remove much of the toxic metals from the body. Under this method, the enzyme pathways may be repaired, blood flow may be restored, and the regulatory systems will become more efficient. Level 3: This is meant for people who are looking for good health and who would like to maintain it throughout their entire lives. This protocol involves one suppository every third day for life. Depending on the frequency of suppositories, one can choose the levels. Protocol 2 – This is meant for clients who need to resolve any immediate health concern, like diabetes or pain. They can take this heavy metal cleanse, every day for a period. This will accelerate the effect. Protocol 3 – are you in fear of life-threatening disease? Well, this one’s for you. You can take the product as often as twice or three times a day. Continue this for a few days. Keep out of the reach of children. Do not use if you are pregnant or nursing. People who are having kidney problems, liver disease, tuberculosis or low platelet counts should not use Medicardium until your doctor approves. The official website of this product offers many deals and discounts. Get free shipping for three boxes of $297.00 at $237.00 only. Get free shipping for 12 boxes of $1068.00 at $828.00 only. Users of Medicardium reported with better sleep. They woke up the next day, feeling refreshed with more energy. Some users also added that it had a de-stressing effect. They felt calmer. Users got more clear thinking. The official website of the product does not show any customer testimonials. Are there any side effects for Medicardium heavy metal cleanse therapy? Individuals with hemorrhoids may experience mild discomfort, but the symptoms may subside within a few hours. Medicardium heavy metal cleanse has not reported any serious side effects from its users. The product may lower blood sugar levels. Can I buy this product from Amazon? No, this is not listed in Amazon. From where to buy Medicardium for heavy metal cleanse? Does Medicardium offer international shipping? Yes, it offers international shipping. They carefully pack the product and ships to you worldwide by Priority Express Mail International. Get free shipping for this formula within US. Are there any heavy metal cleanse products available for sale on Amazon? Yes, Herb Pharm Certified Organic Cilantro Extract is a very heavy metal cleanse product available for sale on Amazon. What are the benefits of heavy metal cleanse? Anybody who is living in this toxic world requires a heavy metal cleanse therapy. This can benefit them massively from a detox. With a heavy metal chelation therapy, you will feel lighter. You will get a strong immune system with elevated energy levels. Your sexual powers are improved, and you will get restorative sleep. Is it safe to use Medicardium heavy metal cleanse OTC supplement? This is a safe and easy alternative to traditional IVs. EDTA may also support the body in dealing with calcification in the soft tissues and joints. Which all metals can be eliminated with this heavy metal cleanse formula? Aluminum, mercury, lead, nickel, barium, arsenic, uranium, and cadmium. Does cleansing suppositories in this formula help to cure a disease? No. Cleansing suppositories are not intended to treat, diagnose, prevent or cure any disease.